When an organization has hundreds of employees across several buildings, it can be difficult to know who’s doing what. This leads to poor customer service as organizations can’t definitively say where an item is in the production process. Nevertheless, this level of oversight is necessary for businesses that want to outperform their competitors. How can they improve communication and oversight without slowing down production? Here is how automatically created to-do lists help CIRCOR Pibiviesse, an Engineered Valves manufacturer in Milan, Italy, collect and produce documentation with a 100% on-time delivery rate. Pibiviesse manufactures custom, highly engineered valves from 1/2’’ to 64‘’ for customers in the piping and energy industries. The process of making a valve requires the coordination of many departments and hundreds of people. Parts, people and processes cover a lot of ground at CIRCOR Pibiviesse. Store all the documentation related to valves in a centralized repository. Create reports on the status of orders to identify production delays and missing documents. Send to-do lists to the appropriate employees when a task or document needs attention. For example, ECM emails a to-do list to department managers of all the manufacturing documents that are currently under their responsibility. By sending this to-do list out every day, Pibiviesse ensures that managers take care of the documentation collection process for each valve order before it moves on to the next step. This to-do list is accessible to employees as well, so that everyone in the department knows what needs to be done and by when. Ensure that suppliers provide certificates with their delivered materials. Compile all the internal certificates related to an order and deliver them to the customer along with the finished valve. 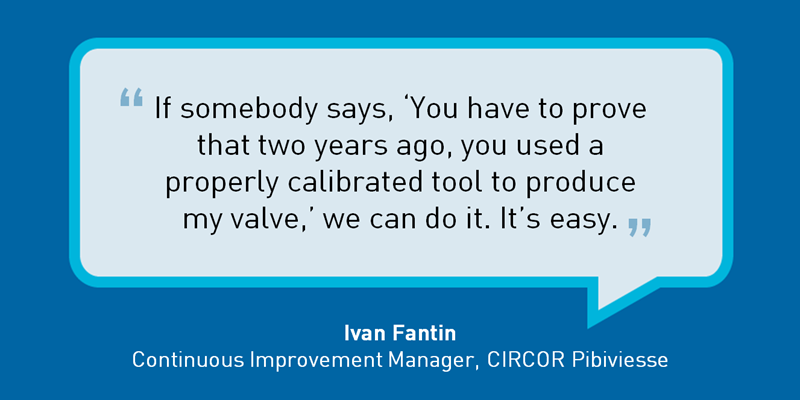 Before using automated to-do lists, Pibiviesse could not track all the certificates it accumulated during the lifespan of a valve’s production, which could last from 6 to 18 months. This was a huge problem, because without these certificates, Pibiviesse’s customers cannot pass industry inspections. Monitor the receipt of materials as they enter the work facility. Cross-check the materials list with the list of certificates already received from suppliers. Generate a daily to-do list of missing certificates to expedite their submission. With this to-do list, document controllers make sure certificates are imported into the ECM repository before they can be misplaced. And because these certificates are required throughout the manufacturing process, this step keeps production moving. At Pibiviesse, all the tools used to measure valves must be regularly calibrated. If they are not calibrated, the company can be held liable for faulty valves. Pibiviesse uses its ECM system to record the expiration date of a tool’s calibration. As tools start to approach their expiration dates, the system automatically emails a to-do list to the tool calibration specialist. This procedure allows the specialist to quickly and easily see what tools must be calibrated, no matter where the tool is located or how long it’s been since the last calibration. Learn more about CIRCOR Pibiviesse’s ECM system and how they streamlined production process with Laserfiche.